One of the biggest capital projects ever planned in San Francisco, the “Clean Water Plan” of the Wastewater Enterprise, involved totally reshaping the way that the sewer system is managed in San Francisco. Its crown jewel would have been the Crosstown Transport, an eight mile long, fifteen foot diameter pipe from the Southeast treatment plant in Bayview to the Oceanside plant by the zoo. The debate around this project was initially characterized by conflict between Bernal Heights and Bayview-Hunters Point. However, through the cooperation of several community groups, a consensus against this project was successfully built. Soon the project was cancelled, and efforts redirected towards building a more sustainable future for San Francisco wastewater management. In 1971, in response to public outcry regarding the condition of San Francisco’s public waterways, the city’s Public Utilities Commission embarked on its most ambitious project ever. Twenty five years and several billion dollars later only one component remained uncompleted: the Crosstown Transport. This 15 foot diameter tunnel under the whole width of the Peninsula would serve to shunt a share of the input to the overtaxed Southeast Treatment plant off to the Southwest plant (1). The story of how this massive project did not come to be highlights both the potential and the challenges facing community organization in the face of an inertial city bureaucracy. Like many issues in city planning, the dynamics of the question of the Crosstown Transport were set up by the particular nature of the location of the project. In this case the Transport would have cut across many distinct neighborhoods all across the width of the peninsula, but the most relevant impacts were on two very specific neighborhoods, Bayview-Hunters Point, and Bernal Heights (3). The impact on Bernal Heights comes from the other fundamental constraint on civil engineering other than politics, namely physics. With a tunnel of this size and length, especially carrying potentially untreated sewage, various gases are produced or released within the tunnel. When the tunnel is full under high storm water conditions, this gas production can build up dangerous pressures which can damage various pieces of sewer infrastructure, necessitating some sort of venting apparatus. Because liquids flow downhill, these gases will naturally gather and thus need to be vented from the highest elevated point in the tunnel, which in the Crosstown Transport’s case happens to be in Bernal Heights. Unsurprisingly the residents of Bernal were not thrilled with the prospect of a sewer gas vent in their neighborhood, animating a large local resistance, which went on to form The Committee to Stop the Crosstown Tunnel as well as The Coalition For Better Wastewater Solutions. These groups passionately protested at every public hearing on the issue for years, sometimes coming wearing costumes (as pictured) (4). With this much public opposition, there must have been power structures of comparable strength pushing for the project in order for it to have made any progress at all. Part of this support came from the Public Utilities Commission (PUC) itself, as this was the last part of the 1971 master plan still remaining unfinished. 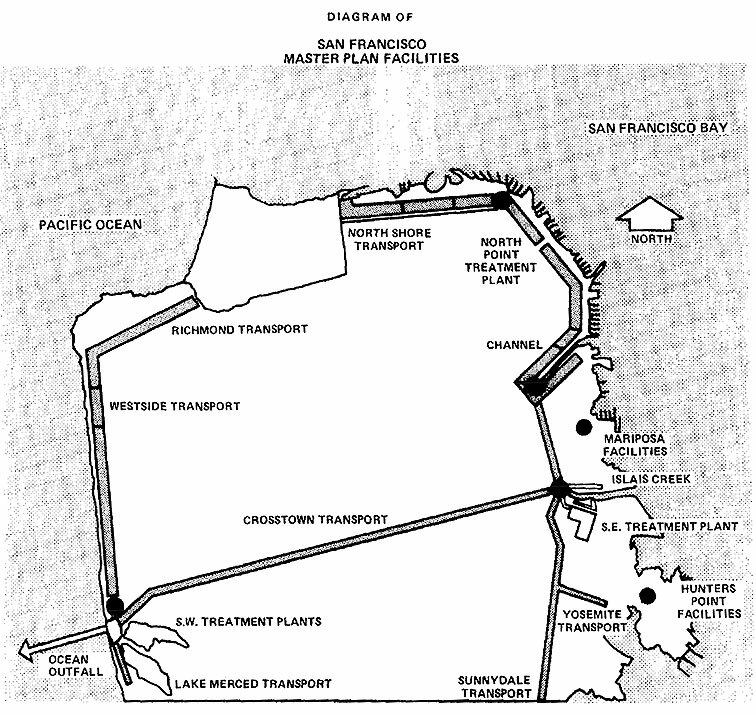 The Crosstown Transport was a necessary part of that 1971 plans idea to solve the issue of San Francisco sewer outflows by piping almost all of it miles off shore to an ocean outflow. By 1990 this basic concept was already starting to show some age, but by this point institutional inertia had calcified around this premise (3). Institutional support isn’t usually enough for a project of this magnitude, and in this case much of the support for the Crosstown Transport was coming from another community on its route: Bayview-Hunters Point. Once the home of a prominent Navy shipyard, this neighborhood has faced a variety of challenges surrounding, and following the departure of, this government facility. Critically, Bayview-Hunters’s Point’s history is deeply intertwined with San Francisco’s decades of institutional racism, serving as both one of the major population centers for people of color in the city (especially after the wholesale bulldozing and “redevelopment” of the Fillmore)(5) and as the city’s “environmental sacrifice zone” (3). Within its borders were the only Superfund site in San Francisco(6), the dirtiest power plant in the city (7), and the biggest of the three wastewater treatment plants in the city (3). As a consequence of all of this, “Health surveys show that in Bayview Hunters Point, rates of cervical and breast cancer were found to be double the rate found in other parts of the Bay Area , and hospitalization rates for congestive heart failure, hypertension, diabetes, and emphysema were found to be more than three times the statewide average.” (8) Because of this, residents were understandably excited by the prospect of lessening the load on the Southeast Treatment Plant, hopefully ending that plants ugly history of dealing with overflow days by spilling sewage into the Bay near their homes. This along with the fact that several of the building trades unions had signed off on the Crosstown Tunnel project, unions with large membership in Bayview-Hunters Point, meant that the general attitude there until the 90’s was very pro-tunnel (3). Ironically, the spark that would undo the stalemate between Bayview-Hunters Point and Bernal was the possibility that a brand new environmental burden was going to be inflicted upon Bayview in the form of a third power plant slated to be built in the neighborhood. In 1995, the The Southeast Alliance for Environmental Justice was formed from several small community organizations in order to defeat this proposal. This fight is certainly deserving of its own detailed history, as it successfully prevented a brand new polluter from setting up shop in Bayview-Hunters Point, and taught this new group (now calling itself SAEJ) what it was capable of (3). In this more empowered climate, it became clear to the longtime Bayview-Hunters Point residents in SAEJ that the Crosstown Transport was not only not a solution to their sewage problems, but acted as new barrier towards achieving real environmental justice. By putting this multimillion dollar tunnel into the ground, Bayview Hunters Point would literally be cementing its position as the way station for sewage in San Francisco. The alternative position they began building was one that involved “cracking” the centralized wastewater treatment mega-plants out into smaller, more distributed facilities. Placing these smaller plants all throughout the city would enable reuse of the treated water closer to its source instead of dumping slightly treated sewage into the ocean. This would also be a gradual solution to the fundamental mistake in San Francisco’s sewer system, namely that it is one of the only cities on the West Coast to utilize a combined sewer for wastewater and stormwater. With the irregular rain characteristic to the region, this will always spell disaster for reliably sizing the sewer system, inevitably leading to overflow of mixed sewage product (3). Ultimately through the efforts of SAEJ and other like-minded groups in Bayview-Hunters Point, the conversation was successfully shifted from one of merely dealing with the situation at hand, to one that sought to solve the environmental injustices inflicted on this community once and for all. With this power base shifting over to the other side of the issue, the Crosstown Transports’s days were numbered, and with the election of the anti-Transport Supervisor Sophie Maxwell to Bayview-Hunters Point’s district in 2000, the Transport was effectively defeated. Even more importantly, the City agreed to commit to make no new capacity increases for the central system as time goes on. Twenty years on and a generation of civil engineering professionals later, many of the basic principles of the opposition to the Crosstown Transport have become part of the “green infrastructure” trend shaping municipal water policy today. Even in San Francisco, new developments like Mission Bay are now built on separated flow systems with more local treatment (3). (1) Steven Bodzin’s SF Sewerage Article. This great article is a history of the sewer system from the founding of the city up until the 90’s. My intention with this article was to pick up where he left off on the topic of the Clean Water Program. (2)	San Francisco’s Wastewater Treatment Program Needs Reexamination And Better Management, page 21 in Appendix II. This is one of the only complete system maps that exist in reference to the original plan. (3)	Phone Interview with Alex Lantsberg. Alex was a program director of SAEJ during the fight against the tunnel, and my interview with him forms the backbone of this article. 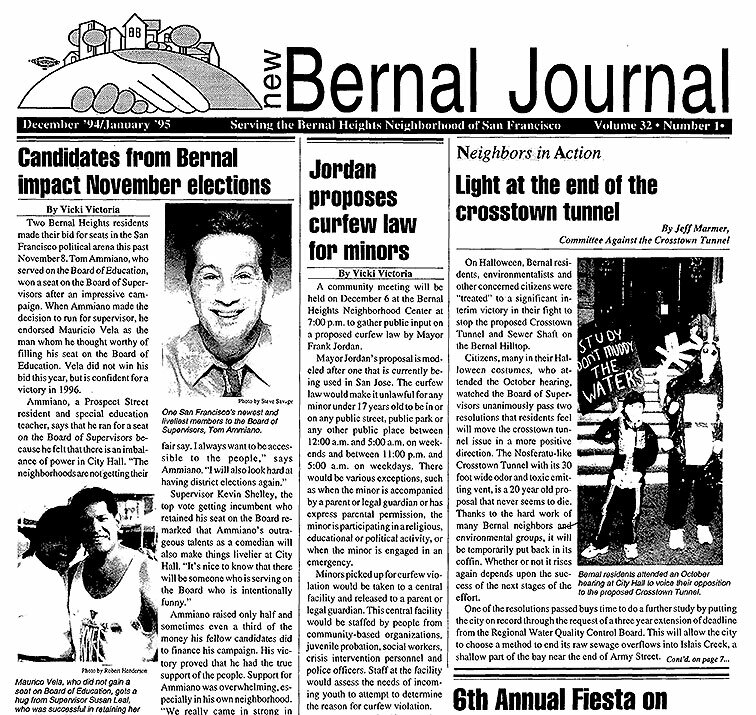 (4)	Bernal Journal article about protests and results towards the Crosstown Transport (which they called the crosstown tunnel). (6)	Superfund sites in California list. (7)	Summary of power plant fight in Bay Nature magazine. (8)	The Bayview Hunters Point Mothers Environmental Health & Justice Committee’s collection of various separate epidemiological studies. Marmer, Jeff. "Light at the end of the crosstown tunnel." The New Bernal Journal, December 1994, 32nd ed., sec. 1. USA. GAO. San Francisco’s Wastewater Treatment Program Needs Reexamination And Better Management. 11th ed. Vol. 83. MASAD. Finch, Kelsey. Trouble in Paradise: Postwar History of San Francisco’s Hunters Point Neighborhood. pdf, Stanford University Urban Studies. Lantsberg, Alex. "SAEJ and the Crosstown Transport." Telephone interview by author. “Cleanup Sites in California.” EPA. Locke, Scarth. “Hunters Point Power Plant Controversy.” Bay Nature. Pollution, Health, Environmental Racism and Injustice: A Toxic Inventory of Bayview Hunters Point, San Francisco. (pdf) Bayview Hunters Point Mothers Environmental Health & Justice Committee.